Beautiful! I put this set in my Master Bedroom with large whitewashed furniture and it is gorgeous. It is also incredibly soft. It has been sturdy enough to tolerate a year of my 80 lb dog too! Imbue your bedroom with a quaint cottage feel with this coverlet set. Creating a mix of shabby chic with modern prints, the coverlet is highlighted with stripes featuring florals, medallions, and geometric designs in green and shades of yellow and taupe. Two shams pull the floral design from the coverlet and three decorative pillows use coordinating colors to complete this look. I ordered the king size & everything fits the bed well. The colors are very true to the pictures displayed. Sea foam green with a little more blues in the floral part. I'm very happy with the weight of the coverlet. Very pleased! I am so happy with the colors, quality and beauty of this Coverlet set. I'm always leary of buying items on line where I can't feel the fabric, but I took a chance and I'm so glad I did. The coverlet is actually heavier than I expected and I'm very happy that it is. This set exceeded my expectations. This is a beautiful coverlet set. It is a bit on the light side which is what I wanted. It came with 2 pillow shams and 3 very cute pillows. I bought this as a gift for my daughter. She wanted something more lightweight for summer, but not thin and flimsy. The colors of this set are beautiful, and, honestly, it looks way more expensive than it was. It is not heavy, and yet it is not thin and flimsy, just the perfect weight for spring and summer. Really nice quality and pops against her light green walls. The pillow shams look beautiful against the cream pillows she also has. LOVE LOVE this Quilted Coverlet. The colors are just like the picture. Gray, yellow, gold, turquoise, sea foam green. The quality is very good and looks great in my newly painted bedroom. Just the right weight and size! Not too heavy and bulky ... and yet cozy. Colors are soft and pleasant. Regarding the color: it has more teal than I wanted since I have a sage bedroom ... however with the soft yellow and grey it goes great. Perfectly snugly! Very beautiful! I really love this quilt; however, I do think it seems a little more light blue-green versus sage green, which is what I was looking for. Since the quilt has a lot of pattern and color though, it really doesn't matter, and the parts with blue/green tones are close enough to the "sage" I was looking for that I still love it. It is SO pretty and soft and just the right weight for summer! My husband loves it too! Well, a husband rarely "loves" anything with respect to home decor, but he does really like--especially the weight of it!! Now I need to switch out some curtains! I really love this set! The colors are so different and beautiful, with muted teal, taupe, and different shades of brown and cream. The accent pillows are so unusual (and lovely), but they tie the look together in a fresh way. A grandmother decorating a granddaughters room she loves the coverlet set set the design for the room. Goes very well with my country/cottage décor. Just what I was searching for in my master bedroom. The colors are better in person. Wish it came with a skirt, but it's simple and lovely. This is really lovely, and the coloring was accurate on my monitor. Nice and light for southern climes. Pillows are well made and a great set for decorating. Love, love, love that green! Truly sweet. I loved the weight, colir and design , it was just too small for our bed!!! I love everything about this set. It is very comfortable and inviting. I am looking for a bed skirt to match. 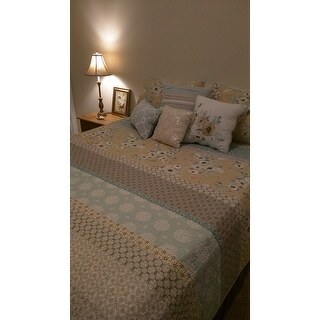 We recently recently painted one of our guest rooms a sot gray and this bedding is perfect with it. The colors are peaceful and the coverlet is very high quality for the price! "Will you get this bedding back in stock?" "Is there white or off white in this set? " It is a light cream off white color. Basically just like the small pillow with flowers on it. It is closer to a pale off white than a stark white. Color and design look amazing. Bedroom is French Country and this pattern will fit my design beautifully. I loved the looks of it. I read all the reviews and the product sounds beautiful. Can't wait to receive it. "is this item----19156152----a true cal king"
I don't have a California king mattress, however, the comforter has plenty of overhang on the regular King mattress, where I don't think you would have any problem.